A Houston police car outside of the Hyatt on Sunday. Houston may have averted a tragedy after a drunk, belligerent man was found to have an arsenal of guns in his hotel room as the venue was preparing for a big New Year's Eve celebration. 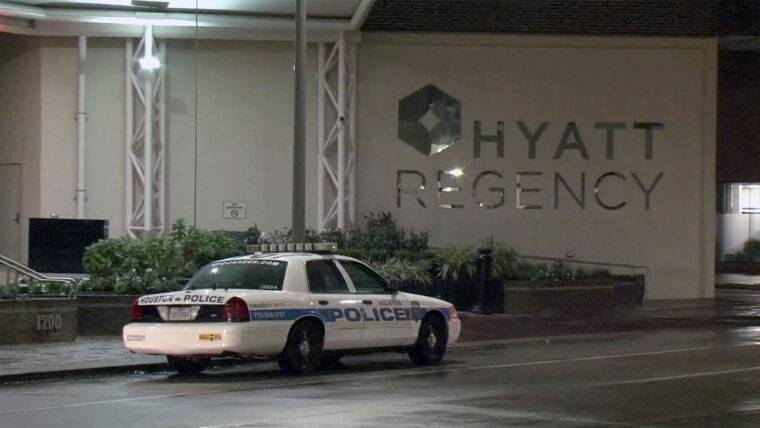 Police discovered the weapons after responding to an incident at the Hyatt Regency Houston where a hotel guest appeared to be “intoxicated and harassing the other guests” at around 1:30 a.m. local time (2:30 a.m. ET) on Sunday, said Houston Police Department spokesman Victor Senties. The man was identified as 49-year-old Russell Lawrence Ziemba, Senties said Sunday afternoon. A police officer who was working an extra job at the Regency was alerted by hotel management about the guest, he said. Ziemba was escorted back up to his room by the officer and hotel management and “the entire time he’s being combative and belligerent and he’s refusing to leave,” Senties said. “The officer notices some ammunition and the male was again acting very suspicious and combative,” he added. Ziemba was taken into custody and responding officers “ended up finding several weapons and ammunition,” he said. Senties said Sunday afternoon that Ziemba told investigators he was at the hotel to celebrate New Year's and had been drinking for a few days. He said he brought the weapons inside because he did not want them stolen from his vehicle parked in the garage, Senties said. Investigators do not believe there was an intent to use the weapons, he added. Multiple senior law enforcement officials told NBC News that Ziemba was extremely intoxicated and depressed when he was arrested. Officials said he recently had domestic relations problems and had to remove his belongings from a residence, including his guns. Ziemba allegedly told law enforcement that he is an Army veteran and did not intend to hurt anyone, according to the officials. Houston Police Chief Art Acevedo said on Twitter that based on the interview, amount of ammunition and other findings, there was "no unlawful intent found." Ziemba is charged with assaulting a peace officer and trespassing. Police talk outside the Hyatt Regency hotel in Houston on Dec. 31, 2017. Senties earlier Sunday that it was an active investigation but "kudos to our officers because they actually prevented what could have been a pretty dangerous situation tonight." The Hyatt is hosting a New Year’s Eve party on Sunday featuring a 50,000-balloon drop and live performances, according to its website. “Our officers did a really good job preventing what could have potentially turned to be something more dangerous,” Senties said. Acevedo said on Twitter earlier Sunday that the situation was “contained” and there were no specific threats to Houston. Tom Netting, managing director of Hyatt Regency Houston, said in a statement that they were fully cooperating with authorities on the investigation. “The safety and security of our guests and colleagues is our top priority, and consistent with the hotel’s prepared security plans, heightened measures are in place on New Year’s Eve," Netting said in the statement.